Kirishima (Kyushu): A “near-crater” warning was issued for the volcano by JMA (Japan Meteorological Agency), in particular for the Iwo crater where an increase in seismic activity, fumarole temperatures and degassing (including poisonous H2S) in an area about 100×100 m wide has been observed over the past months. 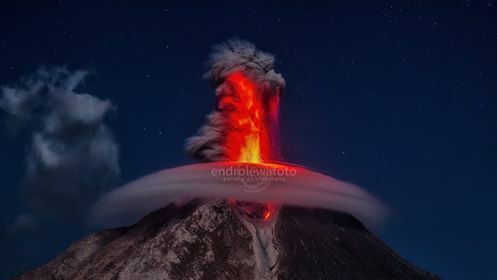 The observed signs of volcanic unrest are considered weak and no eruption is expected in the near future, but the risk of (always possible) sudden, steam-driven explosions, which could affect an area of up to 1 km radius, needs to be considered elevated. The site, a popular excursion destination and easily accessible by road, has been closed for public access now. A similar warning had already been issued in October 2014 and lifted again in May 2015. Sinabung (Sumatra, Indonesia): Over the past days, activity at the volcano seems to have picked up. The frequency and size of explosions from the summit have increased and generated several ash plumes that rose up to approx 3 km height above the summit. In addition, collapses of parts of the lava lobe generated small to moderate pyroclastic flows that traveled up to 3 km down on the ESE side. One of them on Saturday reached again the (already mostly destroyed and abandoned) village of Simacem on the ESE flank at only 3 km distance from the crater. Whether this apparent increase in activity caused by and actual increase in magma and or gas output, or simply a process of releasing accumulated pressure and instabilities on the already emplaced lava lobes on the steep flanks of the volcano is unclear. Momotombo (Nicaragua): The volcano continues to produce on average 2-3 vulcanian-type explosions per day. Some of them seem to generate small pyroclastic flows. Dallol (Danakil desert, Ethiopia): One of our groups visited Dallol last week during our recent Danakil volcano expedition. The hydrothermal activity was observed to be very intense, with many colorful ponds and hot springs.